Marlon Brando, Jr. (April 3, 1924 – July 1, 2004) was an American movie star and political activist. "Unchallenged as the most important actor in modern American Cinema" according to the St. James Encyclopedia of Popular Culture, Brando was the only professional actor, aside from Charlie Chaplin, named by Time magazine as one of its 100 Persons of the Century in 1999. 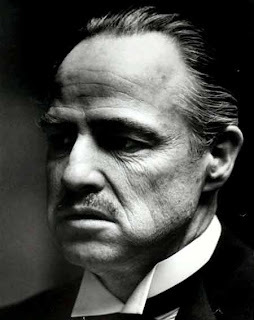 Brando had a significant impact on film acting, and was the foremost example of the "method" acting style. While he became notorious for his "mumbling" diction and exuding a raw animal magnetism, his mercurial performances were nonetheless highly regarded, and he is widely considered as one of the greatest and most influential actors of the 20th century. Director Martin Scorsese said of him, "He is the marker. There's 'before Brando' and 'after Brando'." Actor Jack Nicholson once said, "When Marlon dies, everybody moves up one." He was ranked by the American Film Institute as the fourth greatest screen legend among male movie stars. An enduring cultural icon, Brando became a box office star during the 1950s, during which time he racked up five Oscar nominations as Best Actor, along with three consecutive wins of the BAFTA Award for Best Actor in a Leading Role. 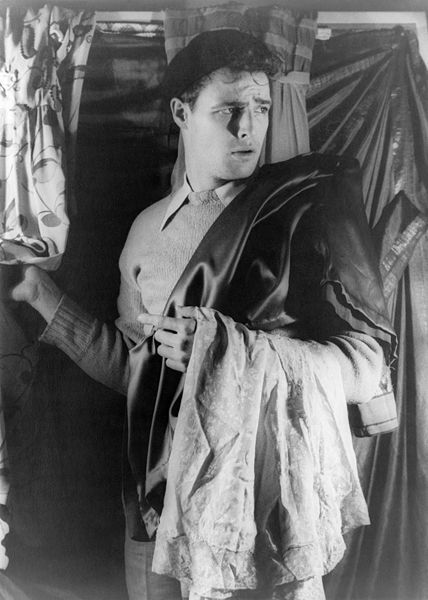 He initially gained popularity for recreating the role as Stanley Kowalski in A Streetcar Named Desire (1951), a Tennessee Williams play that had established him as a Broadway star during its 1947-49 stage run; and for his Academy Award-winning performance as Terry Malloy in On the Waterfront (1954), as well as for his iconic portrayal of the rebel motorcycle gang leader Johnny Strabler in The Wild One (1953), which is considered to be one of the most famous images in pop culture. Brando was also nominated for the Oscar for playing Emiliano Zapata in Viva Zapata! (1952); Mark Antony in Joseph L. Mankiewicz's 1953 film adaptation of Shakespeare's Julius Caesar; and as Air Force Major Lloyd Gruver in Sayonara (1957), Joshua Logan's adaption of James Michener's 1954 novel. Brando made the Top Ten Money Making Stars, as ranked by Quigley Publications' annual survey of movie exhibitors, three times in the decade, coming in at number 10 in 1954, number 6 in 1955, and number 4 in 1958. Brando directed and starred in the cult western film One-Eyed Jacks that was released in 1961, after which he delivered a series of box office failures beginning with the non-success of the 1962 film adaptation of Mutiny on the Bounty. The 1960s proved to be a fallow decade for Brando, and after 10 years in which he did not appear in a commercially successful movie, he won his second Academy Award for playing Vito Corleone in Francis Ford Coppola's The Godfather (1972), a role critics consider among his greatest. The movie, which became the most commercially successful film of all time when it was released — along with his Oscar-nominated performance as Paul in Last Tango in Paris (1972), another smash hit — revitalized Brando's career and reestablished him in the ranks of top box office stars, placing him at number 6 and number 10 in Top 10 Money Making Stars poll in 1972 and 1973, respectively. Brando failed to capitalize on the momentum of his revitalized career, taking a long hiatus before appearing in The Missouri Breaks (1976), a box office bomb. Afterwards, he was content to be a highly-paid character actor in parts that were glorified cameos in Superman (1978) and The Formula (1980) before taking a nine-year break from motion pictures. According to the Guinness Book of World Records, Brando was paid a record $3.7 million ($13,409,697 in today's funds) plus 11.75% of the gross profits for 13 days work playing Jor-El in Superman, further adding to his mystique. He finished out the decade of the 1970s with his highly-controversial performance as Colonel Walter Kurtz in another Coppola film, Apocalypse Now (1979), a box office hit for which he was highly paid and that helped finance his career layoff during the 1980s. A History of the Christmas Card. The Boston Tea Party - 238 years ago today.